In a recent filing with the Federal Energy Regulatory Commission (“Commission”), accession number 20141119-5122, Ms. Sandra Y. Jones alleged that Spectra Energy and Sabal Trail land agents have “threatened eminent domain” against homeowners along the proposed Sabal Trail route. 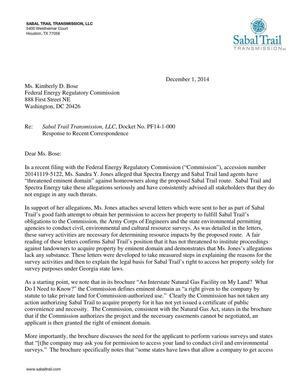 Sabal Trail and Spectra Energy take these allegations seriously and have consistently advised all stakeholders that they do not engage in any such threats. In support of her allegations, Ms. Jones attaches several letters which were sent to her as part of Sabal Trail’s good faith attempt to obtain her permission to access her property to fulfill Sabal Trail’s obligations to the Commission, the Army Corps of Engineers and the state environmental permitting agencies to conduct civil, environmental and cultural resource surveys. As was detailed in the letters, these survey activities are necessary for determining resource impacts by the proposed route. A fair reading of these letters confirms Sabal Trail’s position that it has not threatened to institute proceedings against landowners to acquire property by eminent domain and demonstrates that Ms. Jones’s allegations lack any substance. These letters were developed to take measured steps in explaining the reasons for the survey activities and then to explain the legal basis for Sabal Trail’s right to access her property solely for survey purposes under Georgia state laws. As a starting point, we note that in its brochure “An Interstate Natural Gas Facility on My Land? What Do I Need to Know?” the Commission defines eminent domain as “a right given to the company by statute to take private land for Commission-authorized use.” Clearly the Commission has not taken any action authorizing Sabal Trail to acquire property for it has not yet issued a certificate of public convenience and necessity. The Commission, consistent with the Natural Gas Act, states in the brochure that if the Commission authorizes the project and the necessary easements cannot be negotiated, an applicant is then granted the right of eminent domain. More importantly, the brochure discusses the need for the applicant to perform various surveys and states that “[t]he company may ask you for permission to access your land to conduct civil and environmental surveys.” The brochure specifically notes that “some states have laws that allow a company to get access to property for survey purposes.” Sabal Trail, as an interstate natural gas company, has the right under Georgia law to conduct such surveys. 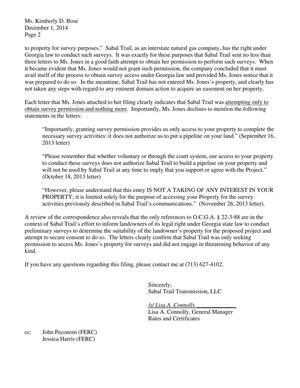 It was exactly for these purposes that Sabal Trail sent no less than three letters to Ms. Jones in a good faith attempt to obtain her permission to perform such surveys. When it became evident that Ms. Jones would not grant such permission, the company concluded that it must avail itself of the process to obtain survey access under Georgia law and provided Ms. Jones notice that it was prepared to do so. In the meantime, Sabal Trail has not entered Ms. Jones’s property, and clearly has not taken any steps with regard to any eminent domain action to acquire an easement on her property. “However, please understand that this entry IS NOT A TAKING OF ANY INTEREST IN YOUR PROPERTY; it is limited solely for the purpose of accessing your Property for the survey activities previously described in Sabal Trail’s communications.” (November 26, 2013 letter). A review of the correspondence also reveals that the only references to O.C.G.A. § 22-3-88 are in the context of Sabal Trail’s effort to inform landowners of its legal right under Georgia state law to conduct preliminary surveys to determine the suitability of the landowner’s property for the proposed project and attempt to secure consent to do so. The letters clearly confirm that Sabal Trail was only seeking permission to access Ms. Jones’s property for surveys and did not engage in threatening behavior of any kind. If you have any questions regarding this filing, please contact me at (713) 627-4102. Sabal Trail has a total disregard to the environment and the property rights of the citizens of not only of our tri-states but the entire United States of America! We are blessed with the Cleanest Water in this Country and no amount of money can repair the damage once it is done to the Florida Aquifer, our source of pure clean drinking water! And now I hear on WCTV news that Florida Power Wants to get in on the Fracking in Florida. People we have got to stop this insanity ! Look at the track record of what this is doing to the rest of the country and now it is here in our front yard. If you are not an environmentalist yet I strongly suggest that you become one. Please take action now! marsh! Unethical cronyism is rampant in government!